It’s hard to imagine a time when the Beatles weren’t world famous, but in November of 1963, they were still on the cusp of international stardom. 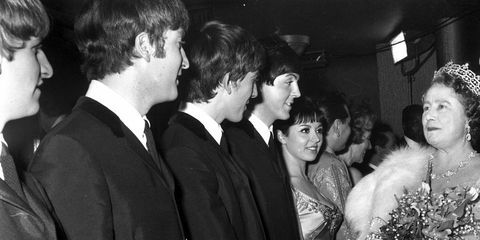 They had gained notoriety in the UK, but were still months away from their iconic appearance on the Ed Sullivan show in the States, and the British foursome was invited to play the Queen’s annual Royal Variety Performance. Little did George, Paul, and Ringo know that near the end of their four-song set, John Lennon would utter a phrase that would go down in the annals of pop history. The Beatles are most intriguing. —The Queen Mother Queen Elizabeth II, a lifetime patron of the Royal Variety Charity, couldn’t attend the concert as she was pregnant with Prince Edward, but in her place, the Queen Mother and Princess Margaret would represent the monarchy. 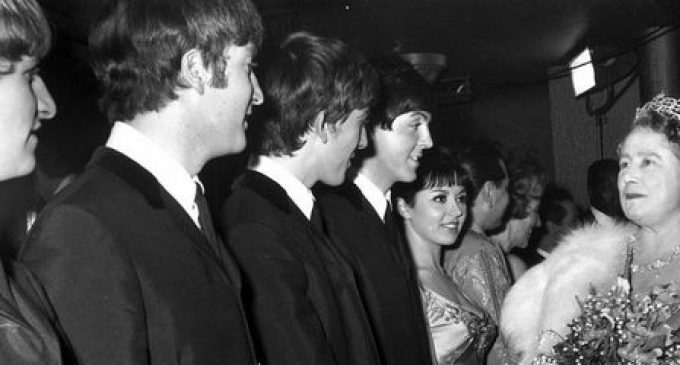 From the beginning, there was concern over the newly cleaned up mop tops playing for the royal family.”People were talking about the fact that the Beatles had Liverpool accents, and that they would be performing for the Queen Mother,” says rock and roll historian Anthony DeCurtis, a longtime contributing editor to Rolling Stone. “The class system, which is still a significant thing in England, was a far more significant thing back then. There’s this whole idea of the King’s English, and the Beatles spoke a dialect.”the beatles The Beatles rehearsing for the Royal Variety Performance at the Prince of Wales Theatre. Right before the show, a broadcaster even asked the band, “Are you going to lose some of your Liverpool dialect for the Royal show?” Paul McCartney teasingly retorted, “No, but you know we don’t all speak like BBC.”When asked by another interviewer if they planned to clean up their language, Lennon, too, mocked the question, first in the King’s English and then in an exaggerated Liverpool scouse.Clearly, the band wasn’t going to change their accents for anyone, not even the Queen Mother.The Beatles were the seventh act out of 19—other notables that year included Marlene Dietrich and Dickie Henderson—and clad in their now-signature suits, the foursome opened their set with “From Me to You.” McCartney appears somewhat anxious or perhaps just overly excited, almost tripping over his microphone as he introduces their second number, “She Loves You,” before they slow it down with a cover of “‘Til There Was You” from The Music Man.